Great for use in hospitals, clinics, and other healthcare facilities. 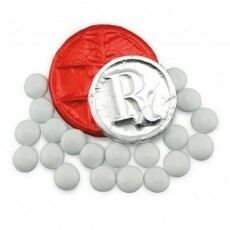 1.6 oz Clear cello bag filled with 1 chocolate foil wrapped Medical Symbol Round, 1 chocolate foil wrapped Rx Round and 0.64 oz Colorific Chocolate Bites. Chocolate foiled rounds available in all four flavors; mix and match chocolate flavors and foil colors for no additional charge.